I would like to read The Miniaturist, the fabulously gripping and complex debut historical novel by English actress and author Jessie Burton. The novel is inspired by Petronella Oortman’s dollhouse now at the Rijksmuseum, but is not a biographical novel. It is set among the Merchant Class of 17th century Amsterdam and starts on a brisk autumn day in 1686, shortly after eighteen-year-old Nella Oortman arrives in Amsterdam to begin a new life as the wife of illustrious merchant trader Johannes Brandt. However neither her splendid new home nor her marriage live up to expectations. And Nella soon finds things very difficult. Johannes is kind yet distant and avoids physical contact, the in-laws are high maintenance and Johannes spinster sister Marin is rather fearsome and seems to be very much in charge of the household. Also in the house are Cornelia, an orphan maid and Otto, an African servant who has been brought back by Johannes from one of his travels abroad. At first Nella is confused and puzzled and finds the household full of secrets, but her life unexpectedly changes when Johannes presents her with an extraordinary wedding gift: a cabinet-sized replica of their home. To furnish it, she engages the services of a miniaturist–an elusive and enigmatic artist whose tiny creations mirror their real-life counterparts in eerie ways. Gradually Johannes’s gift helps Nella pierce the closed world of the Brandt household and it’s unusual secrets. However strange things begin to happen when she orders some miniatures to go in the house. She never meets the mysterious “miniaturist” who creates beautiful and intricate objects – but they begin to arrive unsolicited and seem to predict the future, and Nella begins to understand–and fear–the escalating dangers around them. Is the miniaturist the key to their salvation…or the architect of their destruction. The Battle of Bosworth Field (or Battle of Bosworth) was the last significant battle of the Wars of the Roses, the civil war between the Houses of Lancasterand York that raged across England in the latter half of the 15th century. Fought on 22 August 1485, the battle was won by the Lancastrians. Their leader Henry Tudor, Earl of Richmond, by his victory became the first English monarch of the Tudor dynasty. His opponent, Richard III, the last king of the House of York, was killed in the battle. Historians consider Bosworth Field to mark the end of the Plantagenet dynasty, making it a defining moment of English and Welsh history.Richard’s reign began in 1483 when he was handed the throne after his twelve-year-old nephew Edward V, for whom he was acting as Lord Protector, was declared illegitimate and ineligible for the throne. The boy and his younger brother disappeared in mysterious circumstances, and Richard’s support was eroded by rumours of his involvement in the death of his wife. Across theEnglish Channel in Brittany, Henry Tudor, a descendant of the greatly diminished House of Lancaster, seized on Richard’s difficulties to challenge for and claim to the throne. Henry’s first attempt to invade England was frustrated by a storm in 1483, but at his second attempt he arrived unopposed on 7 August 1485 on the southwest coast of Wales. Marching inland, Henry gathered support as he made for London. Richard mustered his troops and intercepted Henry’s army south of Market Bosworth in Leicestershire. Thomas, Lord Stanley, and Sir William Stanley brought a force to the battlefield, but held back while they decided which side it would be more advantageous to support.Richard divided his army, which outnumbered Henry’s, into three groups (or “battles”). One was assigned to the Duke of Norfolk and another to the Earl of Northumberland. Henry kept most of his force together and placed it under the command of the experienced Earl of Oxford. Richard’s vanguard, commanded by Norfolk, attacked but struggled against Oxford’s men, and some of Norfolk’s troops fled the field. Northumberland took no action when signalled to assist his king, so Richard gambled everything on a charge across the battlefield to kill Henry and end the fight. Seeing the king’s knights separated from his army, the Stanleys intervened; Sir William led his men to Henry’s aid, surrounding and killing Richard. After the battle, Henry was crowned king below an oak tree in nearby Stoke Golding, now a residential garden. Henry hired chroniclers to portray his reign favourably; the Battle of Bosworth was popularised to represent the Tudor dynasty as the start of a new age. From the 15th to 18th centuries the battle was glamorised as a victory of good over evil. The climax of William Shakespeare’s play Richard III provides a focal point for critics in later film adaptations. The exact site of the battle is disputed because of the lack of conclusive data, and memorials have been erected at different locations. The Bosworth Battlefield Heritage Centre was built, in 1974, on a site chosen based on a theory that has since been challenged by several scholars and historians. In October 2009, a team of researchers, who had performed geological surveys and archaeological digs in the area from 2003, suggested a location two miles (3 km) southwest of Ambion Hill. Recently remains have been found on the site of the old Greyfriers Abbey in Leicester(which was destroyed during the dissolution of the monastries and is now a car park) which have been confirmed as those of Richard III. The American fantasy, science fiction, horror and mystery fiction writer Ray Bradbury was born August 22, 1920. Best known for his dystopian novel Fahrenheit 451 and for the science fiction and horror stories gathered together as The Martian Chronicles and The Illustrated Man , Bradbury was one of the most celebrated 20th-century American writers. Many of Bradbury’s works have been adapted into television shows or films, he is credited with writing 27 novels and over 600 short stories, and More than eight million copies of his works, published in over 36 languages, have been sold around the worldThroughout his youth Bradbury was an avid reader and writer. He knew as a young boy that he was “going into one of the arts.” Bradbury was drawing, acting and writing. In 1932, one of Bradbury’s earliest influences was Edgar Allan Poe. At age twelve, Bradbury began writing traditional horror stories and said he tried to imitate Poe until he was about eighteen. At the time, his favorites were also Edgar Rice Burroughs and John Carter as well as comic books. He listened to the radio show Chandu the Magician, and when the show went off the air every night he would sit and write the entire script from memory. In his youth, he spent much time reading H.G. Wells, Jules Verne, and Edgar Rice Burroughs, He loved Burroughs’ The Warlord of Mars so much that at the age of 12 he wrote his own sequel. The young Bradbury also was a cartoonist and loved to illustrate. He wrote about Tarzan and drew his own Sunday panels. Bradbury claimed a wide variety of influences from Robert Frost, William Shakespeare, John Steinbeck, Aldous Huxley, to Thomas Wolfe. He attended Los Angeles High School and was active in both the Poetry Club and the Drama club, continuing plans to become an actor but becoming serious about his writing as his high school years progressed. Bradbury graduated from Los Angeles High School, where he took poetry classes and short story writing courses where the teachers recognized his talent and furthered his interest in writing.When he was seventeen, Bradbury read stories published in Astounding Science Fiction, and said he read everything by Robert Heinlein, Arthur C. Clarke, and the early writings of Theodore Sturgeon and A.E. Van Vogt, but cited H.G. Wells and Jules Verne as his big science fiction influences. In 1936, Ray Bradbury discovered a handbill promoting meetings of the Los Angeles Science Fiction Society. Thrilled to find there were others with his interests, at the age of sixteen Bradbury joined a weekly Thursday-night conclave. Soon Bradbury began submitting his short stories for publication. After a rejection notice from the pulp magazine Weird Tales, Bradbury submitted to other magazines. During World War Two Ray Bradbury started a career in writing after, he was rejected by the military during World War II. Having been inspired by science fiction heroes like Flash Gordon and Buck Rogers, Bradbury began to publish science fiction stories in fanzines, he was also invited to attend meetings of the Los Angeles Science Fiction Society, which met in downtown Los Angeles. His first published story was “Hollerbochen’s Dilemma”, which appeared in the fanzine Imagination! in January, 1938. Bradbury’s first paid piece, “Pendulum,” written with Henry Hasse, was published in the pulp magazine Super Science Stories in November 1941,and he also published “The Lake”, and became a full-time writer by the end of 1942. His first collection of short stories, Dark Carnival, was published in 1947, Bradbury’s short stories, “Homecoming’” was also spotted and subsequently published in Madamoiselle magazine where it won a place in The O. Henry Prize Stories of 1947, Bradbury also wrote his classic story of a dystopian book-burning future, The Fireman, which was later published under the name, Fahrenheit 451. Besides his fiction work, Bradbury wrote many short essays on the arts and culture, and In the 1980s, Bradbury concentrated on detective fiction. Several comic book writers have also adapted Bradbury’s stories. Particularly noted among these were EC Comics’ line of horror and science-fiction comics, which often featured Bradbury’s name on the cover announcing that one story in that issue would be an adaptation of his work. The comics featuring Bradbury’s stories included Tales from the Crypt, Weird Science, Weird Fantasy, Crime Suspenstories, Haunt of Fear and others. Bradbury sadly passed away on June 5th, 2012 after a lengthy illness however he remained an enthusiastic playwright throughout his life and left a rich theatrical and literary legacy, indeed his obituary stated that Bradbury was “the writer most responsible for bringing modern science fiction into the literary mainstream.” And Many of his books have also been adapted for Film and Television. Donna Godchaux, American singer with the Grateful Dead was born 22nd August 1947, formed in 1965 in the San Francisco Bay Area. Originally called TheWarlocks, he Grateful dead were known for their unique and eclectic style, which fused elements of rock, folk, bluegrass, blues, reggae, country, improvisational jazz, psychedelia, and space rock, and for live performances of long musical improvisation. “Their music, touches on ground that most other groups don’t even know exists.” These various influences were distilled into a diverse and psychedelic whole that made the Grateful Dead “the pioneering Godfathers of the jam band world.” They were ranked 57th in the issue The Greatest Artists of all Time by Rolling Stone magazine. They were inducted into the Rock and Roll Hall of Fame in 1994 and their Barton Hall Concert at Cornell University was added to the Library of Congress’s National Recording Registry. The founding members of the Grateful Dead were Jerry Garcia (guitar, vocals), Bob Weir (guitar, vocals), Ron “Pigpen” McKernan (keyboards, harmonica, vocals), Phil Lesh (bass, vocals), and Bill Kreutzmann (drums). Lesh was the last member to join the Warlocks before they became the Grateful Dead; he replaced Dana Morgan Jr., who had played bass for a few gigs. With the exception of McKernan, who died in 1973, the core of the band stayed together for its entire 30-year history. Phil Lesh and Jerry Garcia were brought together by Gert Chiarito in 1964 to perform on The Midnight Special. The Grateful Dead began their career as the Warlocks, a group formed in early 1965 from the remnants of a jug band called Mother McCree’s Uptown Jug Champions, although The band changed its name after finding out that another band of the same name had signed a recording contract. The name “Grateful Dead” was chosen from a dictionary, The definition being that there was “the soul of a dead person, or his angel, showing gratitude to someone who, as an act of charity, arranged their burial.”One of the group’s earliest major performances in 1967 was at the Avalon Ballroom by the San Francisco Hare Krishna temple. The Grateful Dead performed at the event along with the Hare Krishna founder Bhaktivedanta Swami, poet Allen Ginsberg, bands Moby Grape and Big Brother and the Holding Company with Janis Joplin, donating proceeds to the Krishna temple. The band’s first LP, The Grateful Dead, was released in 1967. In 1970 The Grateful Dead performed at The Warehouse in New Orleans for two nights. Mickey Hart quit the Grateful Dead in February 1971, leaving Kreutzmann once again as the sole percussionist. Hart rejoined the Grateful Dead for good in October 1974. Tom “TC” Constanten was added as a second keyboardist from 1968 to 1970, while Pigpen also played various percussion instruments and sang. Following the Grateful Dead’s “Europe ’72″ tour, Pigpen’s health had deteriorated to the point that he could no longer tour with the band. His final concert appearance was June 17, 1972 at the Hollywood Bowl, in Los Angeles and he died in March, 1973 of complications from alcohol abuse. The Grateful Dead formed their own record group, Grateful Dead Records & Later that year, they released their next studio album, the jazz influenced Wake of the Flood. It became their biggest commercial success thus far.During the late 1970s the band went back to the studio, and the next year released another album, Grateful Dead from the Mars Hotel. the Grateful Dead’s next album Terrapin Station was released in 1977. During the 1980s the bands sound transformed. Sadly though Garcia’s health began to decline. His drug habits caused him to lose his liveliness on stage. After kicking his drug habit in 1985, he slipped into a diabetic coma for several days in July 1986. After he recovered, the band released In the Dark in 1987, which resulted as their best selling studio album release, and also produced their only top-10 chart single, Touch of Grey. Inspired by Garcia’s improved health and a successful album, the band’s energy and chemistry peaked in the late 1980s and 1990. Performances were vigorous and as a result, every show exceeded its maximum audience capacity. The band’s “high time” came to a sudden halt when Mydland died after the summer tour in 1990. So Vince Welnick, joined on keyboards and vocals and Bruce Hornsby joined the band as the pianist and vocals on September 15, 1990. The fans of the Grateful Dead, some of whom followed the band from concert to concert for years, are known as “Deadheads” and are known for their dedication to the band’s music. From 2003 to 2009 former members of the Grateful Dead, along with other musicians, toured as The Dead and The Other Ones. 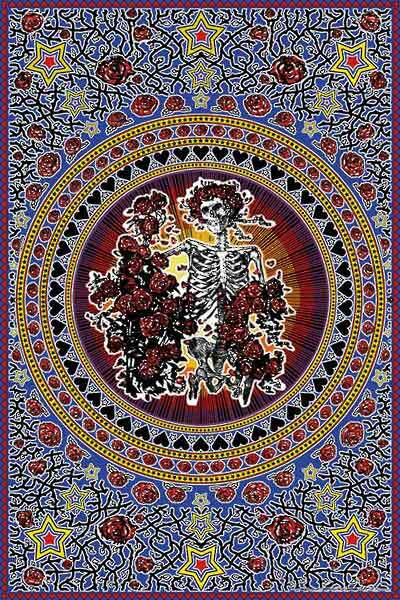 There are many contemporary incarnations of the Dead, with the most prominent touring acts being Furthur and Phil Lesh & Friends and although Jerry Carcia passed away in 1995, the music lives on. Vernon Reid, American guitarist and songwriter with Living Colour was born 22 August 1958. Living Colour were formed 1984 in New York City. Stylistically, the band’s music is a creative fusion influenced by free jazz, funk, hip hop,hard rock, and heavy metal. Their lyrics range from the personal to the political, in some of the latter cases attacking Eurocentrism and racism in America. Living Colour rose to fame with their debut album Vivid in 1988. Although the band scored a number of hits, including “Love rears it’s ugly head” they are best remembered for their signature song “Cult of Personality”, which won a Grammy Award for Best Hard Rock Performance in 1990. They were also named Best New Artist at the 1989 MTV Video Music Awards. After disbanding in 1995,Living Colour reunited in late 2000. Living Colour were formed in New York in 1984 by English-born guitarist Vernon Reid. They grew out of the Black Rock Coalition, a non-profit organization founded by (among others) Reid for black musicians interested in playing rock music. Reid was well known on the downtown New York jazz scenes because of his tenure in Ronald Shannon Jackson’s Decoding Society. Reid assembled a number of bands under the name Living Colour from 1984 to 1986. Early band members included bassists Alex Mosely, Jerome Harris and Carl James, drummers Greg Carter, Pheeroan Aklaff and J.T. Lewis, keyboardist Geri Allen, and vocalists D.K. Dyson and Mark Ledford, with Reid occasionally singing lead vocals himself. The band’s sound was vastly different from the songs that showed up later on their major label recordings. Material from this period included instrumental jazz/funk workouts, politically pointed punk rock burners, experimental excursions via Reid’s guitar synth, and an early version of the song “Funny Vibe”, which was reworked for their debut album Vivid. In 1992, Skillings left the band due to creative differences and was replaced by Doug Wimbish. This new line up released their third full-length album, Stain, in February 1993. The album reached No. 26 in the U.S., a further drop since their debut. Despite retaining their strong fan base, Living Colour disbanded in January 1995, after failing to settle on a common musical goal during sessions for their fourth studio album. Four of these tracks were included on the compilation Pride. Following the breakup, individual band members released a variety of solo efforts. Living Colour reformed on December 21, 2000, at CBGB as a gig billed “Head>>Fake w/ special guests”. Head>>Fake was the current drum and bass project headed by Calhoun and Wimbish. Glover was on the bill to sing a few songs and Reid came on after three songs. The reunion was followed by the release of the band’s fourth studio album, Collideøscope, in 2003, their first album not to chart in the United States, although it was critically praised. 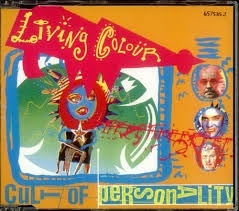 In 2005, Sony Records released Live From CBGB, a live album recorded on December 19, 1989, as well as another best of compilation, Everything Is Possible: The Very Best of Living Colour, with songs from Vivid to Collideøscope.In August 2006, Glover took on the role of Judas Iscariot in a national tour of Jesus Christ Superstar, touring with JCS veteran Ted Neeley. Doug Pinnick, vocalist and bassist of King’s X, filled in for Glover on lead vocals. Glover’s tour of the musical ran through June 2008, and he then rejoined the band. In 2006, Skillings joined the band for the first time in fourteen years when they played at a private party which drummer Jack DeJohnette threw for his wife Lydia. Wimbish was unable to come back from his base in London to play for the event, so Skillings agreed to take over for the special private event. Craig Finn, American singer-songwriter and guitarist American Rock ‘N Roll bands The Hold Steady and Lifter Puller waS born 22 August 1971.The Hold Steady are from Brooklyn, New York, formed in 2004. The band consists of Craig Finn (vocals, guitar), Tad Kubler (lead guitar), Galen Polivka (bass), Bobby Drake (drums), and Steve Selvidge (guitar).Noted for their “lyrically dense storytelling,”and classic rock influences, the band’s narrative-based songs frequently address themes, including drug addiction, religion and redemption, and often take place within the city of Minneapolis. After Separation Sunday, the band moved from the Frenchkiss Records imprint to Vagrant Records. Released October 3, 2006, Boys and Girls in America was ranked No. 8 on theRolling Stone Best Albums of 2006 list, and first by The A.V. Club. Pitchfork Media’s Scott Plagenhoff wrote of the album, “[Craig Finn] not only has a commanding, rousing voice but he also says something worth hearing, displaying gifts for both scope and depth that are all too rare in contemporary rock — indie or mainstream. In 2006, they released a music video for “Chips Ahoy”, directed by Moh Azima and starring Avital Ash. In 2007, the band recorded a modified version of “Take Me Out to the Ballgame” to be played during theseventh-inning stretch at Minnesota Twins home games. They also contributed a cover of the Bob Dylan and The Hawks/The Bandsong Can You Please Crawl Out Your Window? to the motion picture I’m Not There. The band’s fourth album, Stay Positive, was released in, 2008 The album was recorded inHoboken, New Jersey and Wild Arctic studio in Queens, New York with producer John Agnello. Guests on the sessions included Ben Nichols from Lucero, J. Mascis of Dinosaur Jr., Emilyn Brodsky, and Doug Gillard, who played guitar in Guided By Voices. Stay Positive contains Many familiar elements – sing-along choruses, extended piano and guitar solos and lyrics that deal with faith, crime, rumor, loss and love. The Hold Steady has toured and played with a variety of other artists, amongst them Les Savy Fav, The Constantines, P.O.S, Swearing at Motorists, the Rolling Stones (as mentioned in the Stay Positive bonus track “Ask Her For Adderall”), Dave Matthews Band, Counting Crows, The Thermals, Art Brut, Kings of Leon, The Loved Ones, the Oranges Band, and Drive-By Truckers.In April 2009, the band released a two-disc documentary and live album set entitled A Positive Rage.